It’s often said that history only remembers the victors. Recently, the Equality and Human Rights Commission produced a video to, and I quote, “Celebrate twenty years since the passing of the Disability Discrimination Act in 1995.” For disabled people who were involved in the struggle to have the inequalities we face acknowledged and addressed, I doubt there are many of us who will be putting the flags out or popping champagne corks in celebration of the Act itself. The bulk of us who were actively involved remain true to the belief that the passing of the Disability Discrimination Act (DDA) was a significant defeat for disabled people and the struggle against social oppression. This is not to say the passing of the DDA had no positive impact upon disabled people’s lives or had no influence on social change, it did, but acknowledging this shouldn’t detract us from recognising the fact the DDA restricted our progress, was of limited use to disabled people and was never likely to challenge the status quo. It is impossible to produce a balance sheet of the DDA’s true impact because all kinds of external factors operate to mask the truth. It can be argued that the overall struggle for anti-discrimination legislation and specific actions such as the Campaign for Accessible Transport were more instrumental in bringing about organic social change. Over the last twenty years the whole of society has radically changed, and how disabled people have been both seen and treated have been part of that process whether that’s been via Tony Blair’s “rights and responsibilities” agenda or the neoliberal business case for ‘including disabled people’. To fully appreciate our position on the DDA it is necessary to strip away the sugar coated presentation of this historic piece of legislation in order to reveal how the collective voice of disabled people and their many allies were silenced by acts of betrayal and brute force. The real story isn’t really about the twenty years since the passing of this piecemeal, ineffectual and oppressive Act, but rather it is about how the Civil Rights Bill and the ideas contained within it were buried both physically and politically by those who felt threatened by the potential impact it would’ve had on society. The aim here is not to romanticise the campaign for full civil and human rights for disabled people, but instead to recall the major events that led up to the Tories introducing their own Disability Discrimination Bill in order to head off the Private Member’s Bill on Civil Rights Bill and why the passing of the DDA should be viewed as a significant and negative watershed in our emancipation struggle. Neither is it possible to critique the nature or merits of the Disabled People’s Movements campaign, although there’ll be signposts to various opinions on it. ‘The Disabled People’s ‘Rights Now!’ campaign had a rich and diverse membership, including representation from many trade unions. It encompassed direct action, mass lobbies of parliament, petitions and awareness-raising campaigns to support civil rights for disabled people, and the issue was raised in Parliament on 14 separate occasions. The campaign won over a number of MPs and Peers, including Alf Morris, Roger Berry, Tom Clarke and Harry Barnes, who provided much needed political support and sponsored various Disabled People’s Civil Rights Private Members Bills. The campaign reached a turning point in 1994 when the Conservative Government and the then Minister for Disabled People Nicholas Scott were found to have misled Parliament by stating that the cost of implementing civil rights legislation for disabled people would be greater than the sum previously calculated by civil servants. The stark reality is that since the early 1980s there were no less than fourteen attempts to introduce anti-discrimination legislation via Private Members Bills largely introduced, but not exclusively, by backbench Labour MPs. Not only did each fail, they nearly all followed a similar pattern where in Parliament the Tory spokesperson would state that, ‘there was nothing but good will towards the disabled’, and of course, ‘education was better than legislation’ if any problems were to exist. On the other hand, the supporters of the various bills would mainly focus upon employment issues. Meanwhile outside of Parliament there was the ritualised farce of the big disability charities shipping in bus loads of disabled people to parade around Parliament Square before sending them home again. philanthropic and liberationist elements of the disability lobby. Those of us who were involved with VOADL and later, Rights Now, might take issue with the view that the “for” organisations were actually ‘converted’ to the views held by disabled people. Their practice then and since would cast a long shadow over this assumption. An alternative view is that for a long time disabled people’s organisations were only granted observer status within VOADL however the growing momentum behind the British Council for Disabled People’s campaign for anti-discrimination legislation (ADL), began to shift both the focus and the exercising of power and so this ‘conversion’ by the charities had more to do with their fear of being outflanked by BCODP than [it did to] any serious commitment to disability politics. Two central features mark the difference between VOADL and Rights Now. Disabled people drove the agenda and increased the public profile of the ADL campaign, but at the same time worked directly with members of parliament to put together the Civil Rights Bill. Many of us believe that this displacement of the ‘big six’ disability charities resulted in them watering down their commitment to full and comprehensive legislation and a growing willingness to accept compromise as the price of regaining their power position over disabled people. This watershed moment sees the birth of what has subsequently become ‘Janus politics’ – where the charities look back towards the radical language and concepts from the Disabled People’s Movement, but actually creates ‘new meaning’ which transforms them into tools which then help maintain their status. For example, the concepts ‘independent living’ and ‘choices and rights’ now employed by organisations such as Scope and Disability Rights UK are a million miles from their original meaning. Caroline Gooding and Bob Findlay advised the opposition parties on behalf of Rights Now, including writing a briefing paper on the social model and the definition of disability. Once in power New Labour set up a Disability Task Force, but this body steadfastly declined to change the traditional definition of disability to one in keeping with the social model. 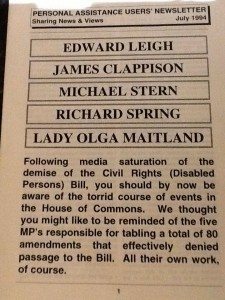 Stepping back a little, the first test for the new wave militancy and Parliamentary campaigning came when Harry Barnes tried to push through the Civil Rights (Disabled Persons) Bill. Their only course of action was to head off our Bill by introducing the weaker Disability Discrimination Bill led by William Hague. This was eventually passed into law twenty years ago as the Disability Discrimination Act. What followed was a two horse handicapped chase. Roger Berry picked up the gauntlet and re-introduced the Civil Rights Bill, but Hague had the advantage of proposing a Bill supported by the Conservative John Major government. It was under these conditions that the ‘big six’ charities made their move. The DDA took only 6 months from beginning to end in becoming law. 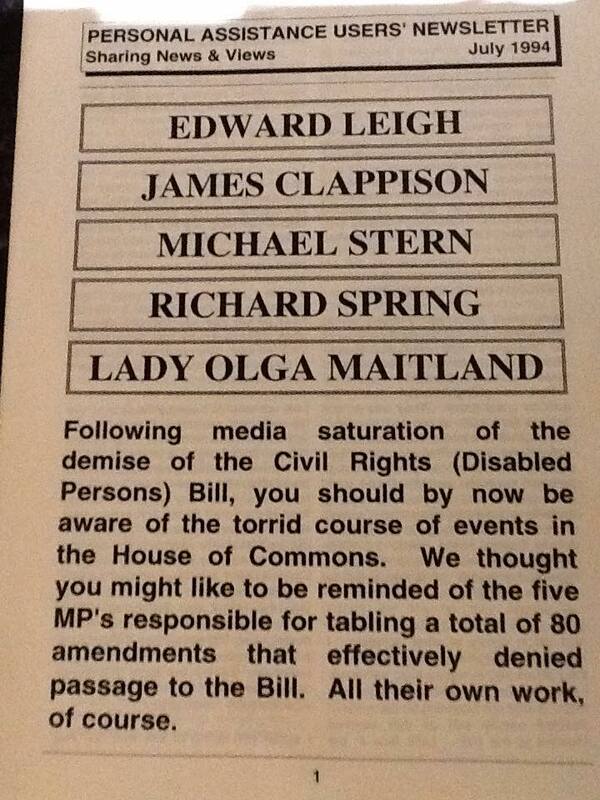 The DDA, unlike the Civil Rights Bill, wasn’t designed to tackle the institutionalised oppression of disabled people. Any hope of repealing and replacing the DDA with the Civil Rights Bill when New Labour came to power was quickly dashed. First, Labour’s Tom Clarke refuted BCODP’s claim that Labour in opposition had promised to do just that. Second, the Task Force already mentioned was hand-picked with more radical elements of the Disabled People’s Movement blacklisted throughout Labour’s terms in office. Margaret Hodge in 2000 when Minister for Disabled People, instructed the BBC to ‘edit out’ criticism of the DDA in its Disabled Century TV program. Third, Labour looked towards the new ‘Disability Movement’ driven by the charities and DPOs willing to buy into Blair’s ‘Third Way’ and the neoliberal market economy. Finally, it was New Labour who brought in Atos to hound sick and disabled people. So, when we’re told the DDA was a victory, what does this mean? There has been a paradoxical development; just at the moment when inadequate legal rights were established for disabled people, the movement for emancipation was outflanked by the big disability charities and made an outcast by successive governments. Since 1995 the Disabled People’s Movement has gone into decline. Internal division and criticism followed the defeat of the Civil Rights Bill, with senior disabled activists accusing BCODP of ‘putting all its eggs in one basket’ by having ‘legislation’ as its prime focus and failing to cultivate grassroots structures and organisation. The DDA gave individual rights, but simply asked for employers and service providers to behave ‘reasonably’. The last five years in particular has witnessed savage attacks on both disabled people’s rights, services and lifestyles. A reverse of disabled people’s fortunes added to by the threat of legalised ‘assisted suicide’ is the reality, not this empty rhetoric of ‘equal citizenship’. Disabled people have been silenced and sidelined for the majority of the last twenty years apart from piecemeal changes in the social environment and attempts at tokenistic ‘inclusion’ here and there. Now the whitewash begins. We see video clips from the Equality and Human Rights Commission and Scope on 20 years of the DDA, producing ‘false history’ via safe narratives and the worst of all, the Heritage Lottery Fund supporting Leonard Cheshire’s empire to write ‘disability history’ (sic). Ellis’s piece for the HLF on the DDA is another example of revisionism with a dash of criticism thrown in. Those of us who lived and fought through the 1980s and 1990s see no cause to celebrate. Politically, we were defeated in 1995; our slogan, “Nothing About Us, Without Us”, has still to be realised. Although the last twenty years has been an uphill struggle to keep the fight for emancipation alive, we are seeing yet again a new wave of determination among disabled people; people who believe in freedom and social justice. These green shoots are what we should be celebrating today, not the results of the falsification of history written by our oppressors and shameful or misguided collaborators. Equal Rights for Disabled People: A Case for a new law – IPPR. Bynoe, I. (1991) THE CASE FOR ANTI-DISCRIMINATION LEGISLATION in Bynoe, I. et al., Equal Rights for Disabled People: A Case for a new law – IPPR. Gradwell, L. (2015) Comment on her Facebook page, 4th November. Very interesting article. Though I think it is worth adding that the limited protections provided in the DDA (and now in the Equality Act) were weakened under the Coalition government and are under even greater threat from the current Tory government. But I agree that disabled people’s organisations are more determined than ever. A response to Tomlison minister for Disabled People Have you been discriminated against at work?